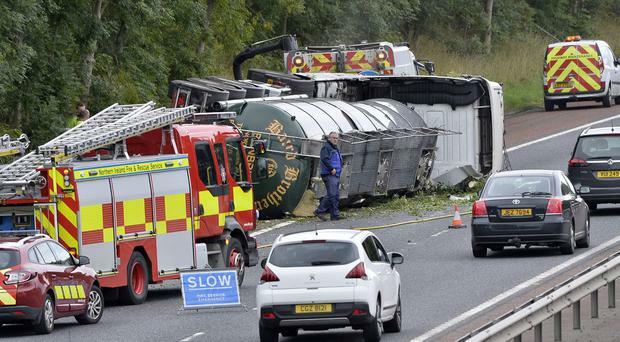 A tanker has overturned on the M2 northbound. The incident happened close to junction 6 at Templepatrick. The inner lane of the motorway is closed but passable with care. A spokesman for the Northern Ireland Ambulance Service said: "The Northern Ireland Ambulance Service received a 999 call at 11:52am following reports of a road traffic collision involving a lorry on the M2 between Junctions 5 and 6. "NIAS despatched one Emergency Ambulance crew to the incident. "Following assessment at the scene, no one required transport to hospital."